This past weekend, I had a wonderful afternoon playing solo flute music for the Mother's Day Tea at Brookdale Senior Living Center near Denver, Colorado. I put together a fun set of music from classical to contemporary and jazz tunes. It was lovely to meet some of the residents and their families and I think that they enjoyed listening just as much as I enjoyed playing for them. As I played, the guests enjoyed dainty treats and hot tea on that beautiful sunny afternoon. Do you want more information about my elegant solo flute music for your wedding ceremony or next event? Tell me what songs and musical styles you like and I'll put together a custom music set list just for you! 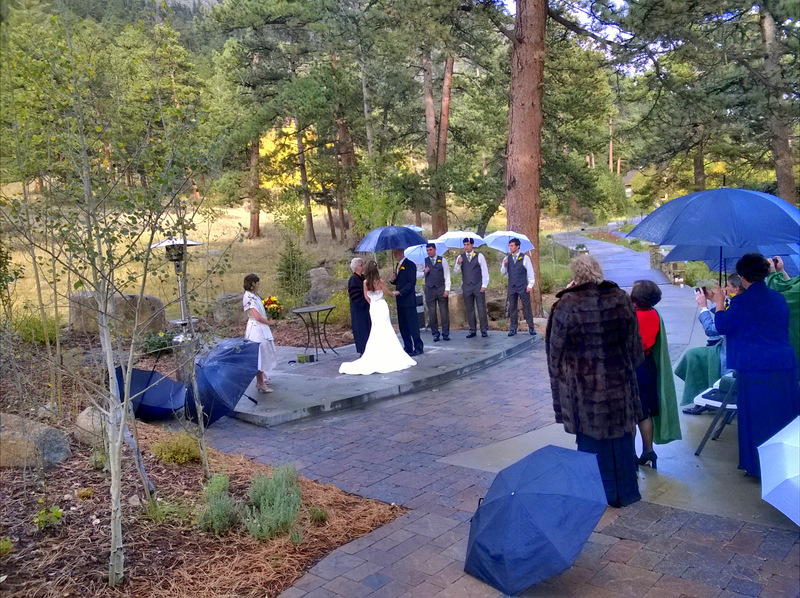 In early June, I played solo flute for a charming 1920's inspired wedding ceremony at Sapphire Point in Dillon, Colorado. Sapphire Point is an overlook that boasts a stunning view of the Dillon Reservoir and the Gore and Tenmile mountain ranges. As I set up my things, I watched the antics of a curious chipmunk, who was eating some trail mix and inspecting a darling parasol that was ready for the bride in case of sun. Sun wasn't a concern after all, because rain was threatening and we all prayed that the storms would hold off for the wedding ceremony. At the bride's request, I played upbeat classical and Irish music for the prelude as the guests arrived. The weather was beautiful until the middle of the ceremony when large guests of wind blew in dark masses of clouds and it began to rain. The bride and groom agreed to end the ceremony early. I was still able to play the recessional music in the rain because I brought my backup flute - a special flute that is made of plastic and completely waterproof. From the bride: Christen was great. Even when the weather changed our plans last minute with no rehearsal, Christen kept right on track and made the day perfect. When working with her to plan the wedding music, she was so helpful and professional. She also sounded amazing! Everything was perfect from working with her in planning down to the ceremony and all the last minute changes. We definitely recommend her for your event! 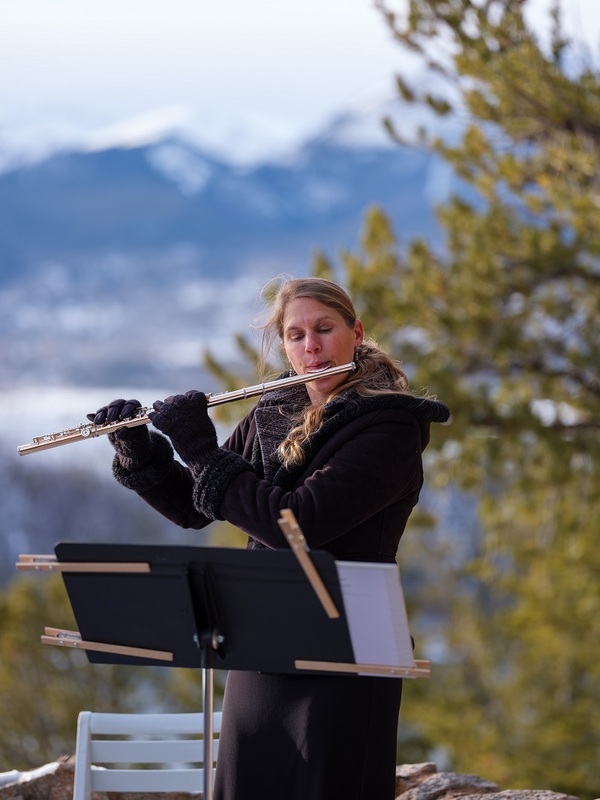 I recently enjoyed playing solo flute for the wedding ceremony of a delightful couple in Denver, Colorado. The bride was from Turkmeninstan, the groom was from England and their former college teacher from California officiated the wedding ceremony. Of all the places in the world to get married, this couple chose the beautiful Denver Botanic Gardens in Denver, Colorado. They were married under the Water Garden Gazebo by the peaceful Monet Pool, which reflected the beautiful flowers and puffy clouds.The weather was beautiful with just enough clouds in the sky to keep the temperature very comfortable. The ceremony was small with just close family and friends and everyone was so warm and friendly that I felt quite welcome. "Christen was absolutely amazing! We had our wedding ceremony at Denver Botanic Gardens on June 7, 2016 and couldn't have wished for the greater experience with Christen. We were absolutely impressed with her music, she made our special day magical! The guests loved Christen's playing. I recommend her to anyone who wants beautiful music for their ceremony/wedding, you will be amazed!!!" I traveled up to Vail on this hot summer day to play solo flute for a wedding ceremony on the beautiful Vail Wedding Deck. The hot sun shone down on me and I wished I brought sunscreen, but there was nice cool breeze. The guests began to arrive 45 minutes before the ceremony, and since I was set up already, I began playing early to give them lovely music to walk in to. The bride requested that I play jazz and popular music so I put together a song list that I thought the guests would enjoy. This hot day began with a beautiful cool morning, perfect for an intimate wedding ceremony at the War Memorial Rose Garden in Littleton, Colorado. This picturesque gem is located near downtown Littleton and across the street from beautiful Sterne Park. The roses were just beginning to reach peak bloom and their scent filled the air with a sweet, nostalgic perfume. As a former music major, the groom had many ideas for his music selections and I incorporated them into the prelude, postlude, and dinner music. As guests began to arrive, I played a prelude of classical and traditional Irish music on solo flute. The wedding ceremony was very simple with only immediate family and friends attending. After the wedding ceremony, I played for fifteen more minutes as the wedding party and family were photographed. Dinner was held at Maggiano's which is the couple's favorite restaurant. I began by playing some classical and Irish tunes and then switched to show, jazz, movie, and popular music. The groom made a special request that my last song be "Feeling Good", and I really enjoyed learning that wonderful classic song. The guests enjoyed drinks and appetizers while I played and when I finished, dinner was served. I was invited to join everyone for dinner and particularly enjoyed the pork and mashed potatoes and one of the best cheesecakes I've ever had. This past Saturday was truly a remarkable experience and I was privileged to be invited to play my flute for the memorial service and reception honoring Jim Vincent. The weather was perfect for the service, which took place in Vail Memorial Park in an idyllic mountain setting. We were surrounded by mountains, tall pines, and large boulders with a bubbling river winding through the woods nearby. When I arrived at the memorial site, I had the pleasure of once again seeing Pastor Tim Wilbanks, who later did a wonderful job presiding over the ceremony. I played classical music on solo flute for the prelude and after Pastor Wilbanks gave a welcome speech, I honored Jim Vincent by playing one of his favorite songs, "I Just Called to Say I Love You" (Stevie Wonder). At the end of the service, I played "My Way", a song that Jim Vincent personally requested be played at his memorial service. I really enjoyed the service as various family members and friends stood up and told both humorous and nostalgic stories about Jim Vincent. By the end of the service I really felt like I personally knew Jim. Afterwards, we all left for the 10th Restaurant in Vail. I drove to Vail Village and took the gondola up to the restaurant. This was my first time up a gondola, and I really enjoyed the ride and the view of Vail Village and the surrounding mountains. When we arrived at the restaurant, Adam Revell was already entertaining the guests with some light jazz on his keyboard. I joined him on my flute and we played a number of popular and jazz selections for the elegant three-hour reception. I was given great freedom with the music selections and I aimed to create a nostalgic and sometimes upbeat mood. The guests really enjoyed the music and I even spied a few of them dancing as they walked by. Busking I’ve never played music on the street for tips before, but busking is something I’ve always wanted to try. For Colorado musicians, there is no better place to play than Pearl Street Mall, one of the top busking locations in the US. Pearl Street is a pedestrian shopping area in the heart of Boulder, and on any given day, it’s usual to see musicians, artists, and novelty entertainers of all kinds performing outdoors. Big Surprise! This past Saturday was a beautiful day and I took my flute and headed out to Pearl Street to try my hand at street performing. What I did not expect were the thousands of people, fairies and other mythical creatures that crowded the center of town. I had unintentionally arrived just in time to play during the Boulder Tulip Fairy and Elf Festival. I found my own performing space somewhere between a guitarist playing on a platform that looked like a giant double bass and a fire tossing juggler. My biggest fans turned out to be little girls in fairy dresses who twirled and danced to the tunes I played on my flute. Experiments As I played, I experimented to see what kind of music drew the most tips. 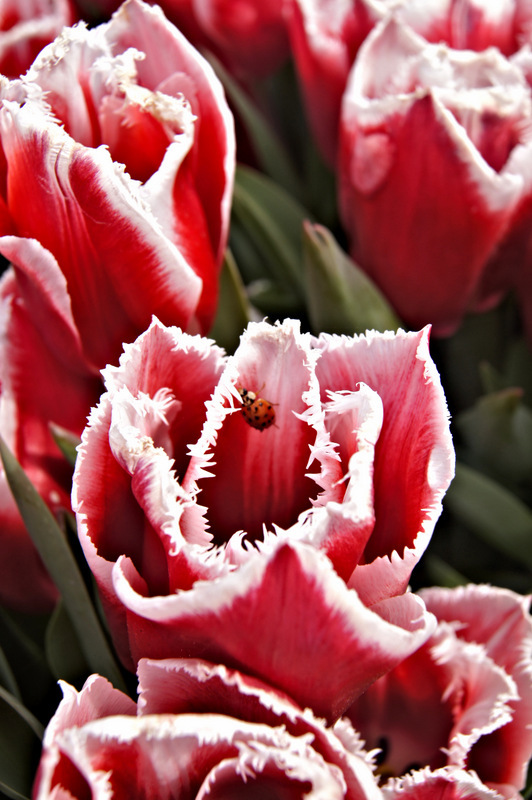 The most loved Tulip Fairy and Elf music? Slow romantic or classical music, as long as I played loud enough to be heard over the noise of the crowd. The two favorites were “Londonderry Air” and “Meditation from Thais”. Jazz, Celtic and lively classical music didn’t do as well. Once I found out what kind of music my audience of young fairies preferred, the tips came in regularly and I left with some money in my purse and satisfied with an enjoyable experience. I am planning on busking again sometime, so if you are ever on Pearl Street and see a flute player, or if you are lucky, a flute and harp duo, that just might be me. The following is a list wedding processional music that I have handpicked and compiled for 2013. Some of these songs are new and some are old friends paying a return visit, but all of these songs will sound great with the flute. Classical Wedding Processional Music Ideas: Classical music sounds great with flute and harp, flute and guitar, solo flute, flute and cello, flute and violin, and flute and strings trios and quartets. Visit my Ensembles page for music samples. These contemporary music selections will sound great with flute and harp, flute and guitar, and flute and string trios and quartets.